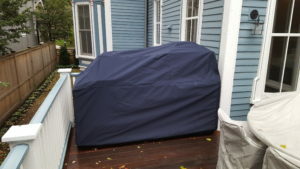 If you have an outdoor kitchen area, or an outdoor grill that needs a custom cover created, we are the people you come to for Outdoor Kitchen Covers! Using our 3D measuring device, we come out and begin our process. After we take measurements, we come up with a custom design using CAD software for each job we are hired for. Then we help guide you to what fabric is best for the job. 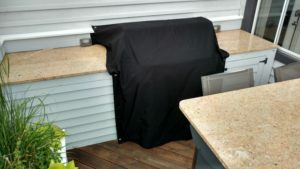 Sunbrella is great for keeping things dry and comes in a wide variety of colors as well as different kinds. Want to really make sure your stuff wont get wet or damaged in the snow? Sunbrella offers many different kinds of fabric that vary from their regular marine canvas to SeaMark which has a rubber backing which really helps keep whatever you are covering dry. Need something more heavy duty? We can create a cover in Stamoid fabric which is very resistant to all kinds of weather and will keep your outdoor kitchen or grill looking like it is brand new! 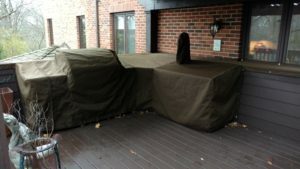 We even do more simple custom slip covers that slide over your grill. Covers like these can have velcro straps that tighten at the base so it wont fly anywhere. 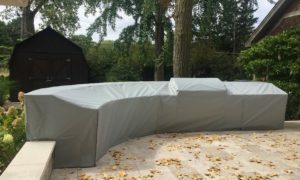 If you are worried about your cover flying away, we can even add DOT snap fasteners to the cover and to your area that needs covering! Each customer has different wants and needs that we make sure to fulfill! 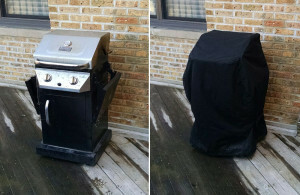 Want zippers on a certain area so you can leave your cover on but still have access to the grill? We can do that! Talk to us about what you have in mind and our team can help fabricate the cover of your dreams! Invest in your investments and keep them dry with our help!